It was as if the gunman had gone out hunting, targeting strangers as they carried out quotidian tasks on their own property. One victim was shot dead as he sprayed weeds in rural East Baton Rouge Parish. Another was gunned down outside his home at the Avondale Scout Reservation in Clinton. The slayings, seemingly indiscriminate, sent a shudder through the quiet communities of Pride and Bluff Creek. Mothers forbade their children to play outdoors. A grass-cutting crew adopted a rotation of armed lookouts. The anxiety was only heightened by a similar — and overlapping — pair of shootings that shook Baton Rouge last month, ambush-style killings that authorities said may have been racially motivated. Taken together, the attacks bore a haunting resemblance to a past era of murder for the sake of murder in the Capital City, a region that has produced an uncanny number of serial killers over the past two decades. "When people can relate to the victims, you see that public panic starting to take place," said Pat Englade, the former Baton Rouge police chief who in 2003 led a multi-jurisdictional task force organized to capture the serial killer Derrick Todd Lee. "Everybody in East Baton Rouge Parish can relate to a man working in his yard. Everybody does that." A terrifying three months passed between the first shooting this summer and the arrest of Ryan Sharpe, a man authorities described for the first time Friday as a "serial killer." Sharpe, who said in a court hearing he has not hired a lawyer, is accused of fatally shooting three men and wounding another before being taken into custody last week, a couple days after the most recent killing. All four shootings of the middle-aged men occurred within a 25-mile radius. "Everyone felt like they were in danger because the shootings appeared to be random," said Greg Phares, chief criminal deputy at the East Feliciana Parish Sheriff's Office. "I think there's a great sense of relief in our parish given people's justifiable fears over the past several months." Sharpe's arrest came less than a month after another man, Kenneth Gleason, was booked in the fatal shootings of two black pedestrians, stranger-on-stranger killings that prosecutors described as "cold and calculated" and police said could have a racial motivation. Those killings spanned just three days, as Gleason was quickly taken into custody following a frenzied manhunt by the Baton Rouge Police Department. Before the arrest, detectives distributed in an internal bulletin to law enforcement that warned, "We cannot predict where this person may strike again." Gleason, a 23-year-old white man also accused of shooting at the house of black neighbors in the same week as the killings, has maintained his innocence through an attorney. He is not yet charged. But if convicted, he also would meet the FBI's definition of a serial killer — someone responsible for two or more murders at different times. "There's no telling how many people would have been killed if the police had not made these arrests," said Susan Mustafa, a journalist who has written books about Lee and another Baton Rouge serial killer, Sean Vincent Gillis. "Once a serial killer gets his first taste of blood, they don't usually stop." The recent slayings — and the pressure law enforcement faced to solve the concurrent cases — recalled a notorious chapter of violence for Baton Rouge in the late 1990s and early 2000s, when no fewer than three serial killers tormented the city. The Lee case garnered national attention and prompted a vast expansion of the state's DNA database. It also drew attention to the slayings of several Baton Rouge women that remain unsolved to this day. Preying on the community at the same time as Lee, who was connected to seven murders, was Gillis, who confessed to killing eight women between 1994 and 2004, often mutilating and photographing his victims. There was also Jeffery Lee Guillory, who was accused in the slayings of women in 1999, 2001 and 2002 and who remains a suspect in several other unsolved killings. 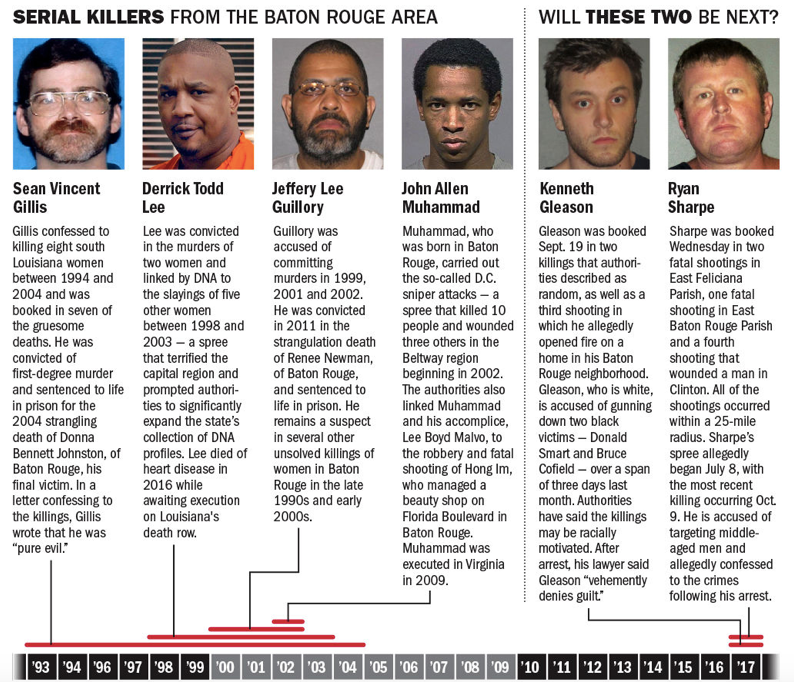 Another serial killer who grew up in Baton Rouge, John Allen Muhammad, carried out the so-called D.C. sniper attacks in 2002. Muhammad, who was executed in 2009 in Virginia, and his accomplice were also indicted for a fatal shooting and robbery in Baton Rouge that happened before a three-week killing spree that left 10 people dead in Maryland, Virginia and the District of Columbia. Serial murder is hardly unique to the Baton Rouge area, though it is more often associated with major cities like Chicago and Los Angeles, jurisdictions that have had scores of serial killers throughout their histories. But the Baton Rouge serial killings were such a law enforcement priority that prosecutors here lobbied the legislature to adopt a law in 2009 that makes it easier for district attorneys to seek the death penalty against serial killers. That bill, passed after the Gillis case, added an element to the state's first-degree murder statute that allows the state to seek capital punishment when a defendant "has previously acted with a specific intent to kill or inflict great bodily harm that resulted in the killing or one or more persons." Hillar Moore III, the East Baton Rouge Parish district attorney, has said he is considering using that law to seek the death penalty against Gleason. "We needed a serial killer statute," Prem Burns, an assistant of Moore's who prosecuted Gillis, told The Advocate last month. "I'm glad we have it." The city's violent history has spawned a range of speculation about the factors that contribute to the proliferation of serial killers. Tony Clayton, an assistant district attorney in the 18th Judicial District who prosecuted Lee and Gillis, pointed to what he described as a disturbing lack of resources for the mentally ill in Louisiana. "I don't think it's in the air or in the water," Clayton said. "I think you'll see an element of some psychosis in each and every one of these serial killers, and it's a direct cause of not having access to these resources and not being able to diagnose these folks." Ben Odom, a longtime Baton Rouge homicide detective, said it was no accident that the likes of Lee and Gillis operated in a community with universities like LSU, which he described as "a fertile field for serial killers who want to kill women." "We agonized over that question for a long time when we had three serial killers working at once in Baton Rouge," Odom said. "These guys were hunters. They did their homework. Another former Baton Rouge police chief, Jeff LeDuff, said he finds the city's history so troubling that the FBI's "experts at Quantico," Virginia, should examine it. "I think it's something that criminologists and law enforcement really need to sit down and come up with an answer for as to why this keeps happening," LeDuff said. "It's something we should be concerned about." In the case of Sharpe, the alleged gunman arrested last week, authorities were reluctant at first to use the term "serial killer." That initial reticence could have been an attempt by law enforcement to avoid sensationalism at a time when the community's nerves are already frayed. Phares, the East Feliciana chief deputy, said authorities Friday decided to adopt the phrase "serial killer" after Sharpe's arrest based on the FBI's definition of the term. It's also true that the definition of "serial killer," a term first coined in the 1970s, has evolved. The FBI adopted its current definition in 2005. "But if you ask 10 experts for a definition, you will get 10 answers that vary in terms of numbers of kills and motivation," said Michael Aamodt, professor emeritus at Radford University who maintains a vast research database of serial killers and their victims. The Northeastern University Atypical Homicide Research Group said last week that Sharpe fit the profile of a serial killer in part because he used a firearm — the weapon most commonly chosen by such offenders — and allegedly confessed to authorities. But the case is unusual in that Sharpe is accused of targeting men "in the late stage of their lives," said Enzo Yaksic, the group's co-founder and a longtime researcher of serial killers. Yaksic also said it is "exceedingly rare for serial murderers to be motivated to kill by mental illness or by urges beyond their control." "More often than not," he wrote in an email, "serial killers deliberately choose their course of action and can also decide to end their campaigns of violence on their own terms. While some serial killers operate at the behest of a desire to placate an internal drive for gratification, it is a myth that all serial killers are compelled to kill." Last edited by CharlesMartel; 10-15-2017 at 09:57 AM.